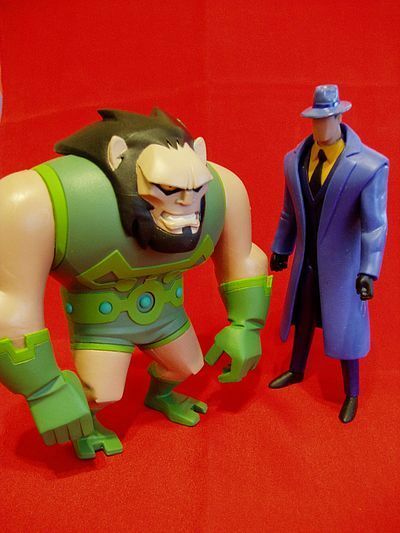 Disneyboy checks in tonight with a look at some recent Matty Collector JLU figures - take it away DB! It’s pretty darn awesome that there are still Justice League Unlimited action figures being made. Through several incarnations, the Mattel line has delivered many fan-requested characters that Kenner’s previous Batman and Superman lines never even touched. 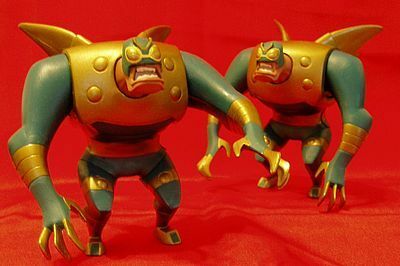 Most recently, Mattel tried to cater to their JLU fans by releasing an awesome Lobo figure online through their Mattycollector website. 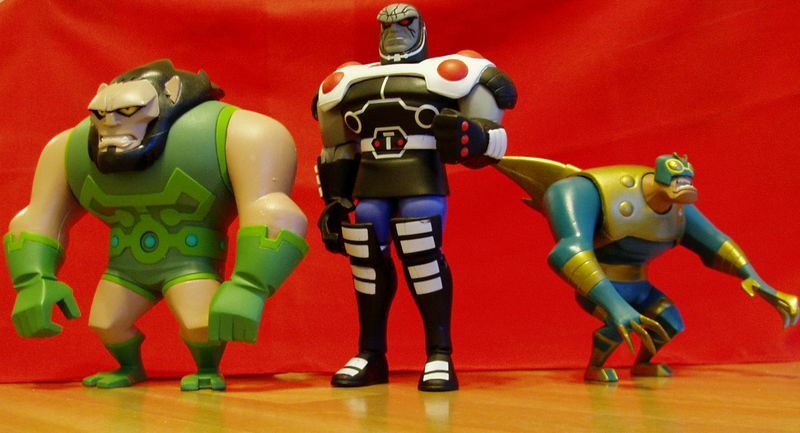 Fans scooped up the 20 dollar figure and Mattel was so impressed that they opted to release these guys through their website as well – the Parademon two-pack and the Darkseid/Kalibak two-pack. There’s a bit more to the story there (okay – a LOT more), but before we get to that, let’s review ‘em! I should probably say up front that I’m not a MOC collector. I take my toys out of their boxes, and would probably feel better if they were packaged in some bland, easily recyclable box with just the basic information stamped on the front. For those of you who like packaging, however, these look just fine. Both have attractive images of the lead Leaguers and villains on their sides without obstructing your view of the figures themselves. 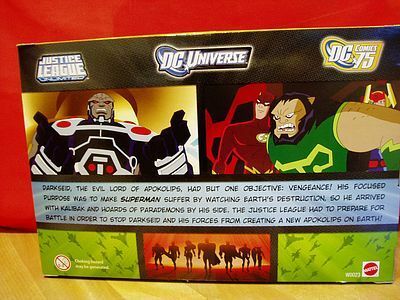 The back of each box has screenshots of the characters and a small explanation of what they’ve done in JLU episodes. 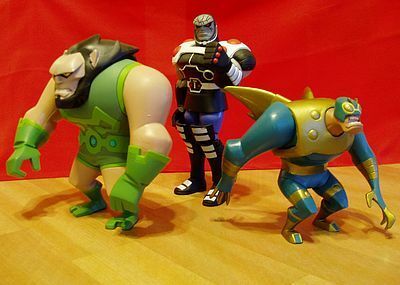 In the case of Darkseid and Kalibak, however, the little paragraph states that Darkseid invaded earth (during the JLU series finale “Destroyer”) with Kalibak in tow. 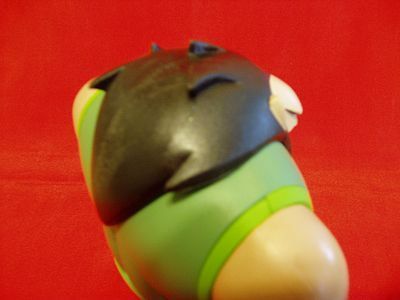 In actuality, Kalibak never appears in the episode. Small goof there. 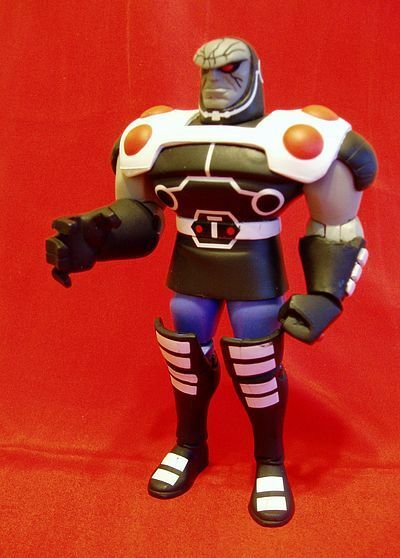 Darkseid is a new version of Mattel’s original figure, which is fine since it’s still one of the best sculpts in the line. Essentially, they’ve added a glued-on shoulder piece, given him two new hands (definitely a nice touch) and repainted the rest of the suit to reflect his redesign in “Destroyer”. It works well, though some might argue that his boots should be thicker, as they were on-screen. A minor qualm over what is still a terrific figure and unlike your usual Mattel JLU figure, he actually seems made of decent plastic. Matty has a track record for making figures with legs that bend like string cheese left in the sun. Case in point – the parademons. They look pretty much show-accurate, with great snarling faces and pointy claws…but try holding one of these guys by their claws or wings and you’ll immediately want to put them down. Though their torsos and heads are firm, the extremities of these figures are not. The demons’ sculpt is based on that of Mattel’s Etrigan figure. I found the scale too small and squat for Etrigan (especially when you consider how much larger he was in The New Batman Adventures), but this size works better for the demons, who are essentially attack dogs anyway. 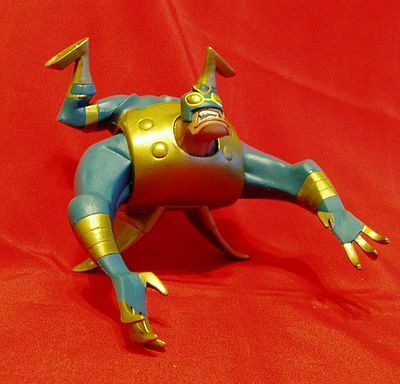 Credit must be given to the work of customer extraordinaire Cason Pilliod (of Inanimate Objects), who first resculpted Etrigan into a parademon several years ago, and likely inspired this official Mattel version. Though most of the Mattel figures are sculpted in “model sheet” poses (standing at attention with their arms at their side), this doesn’t work quite so well in the case of the demons, who are always seen in full-on battle mode whenever they appear. You can’t really pose these figures to look like they’re flying at Superman, or clawing at the Flash with those tiny rabbit legs permanently bent. They just sit there like gorillas resting on their knuckles, which is unfortunate for such dynamic characters and bumps their sculpt down a peg in my books. Finally, the character we’ve all been waiting for – Kalibak. 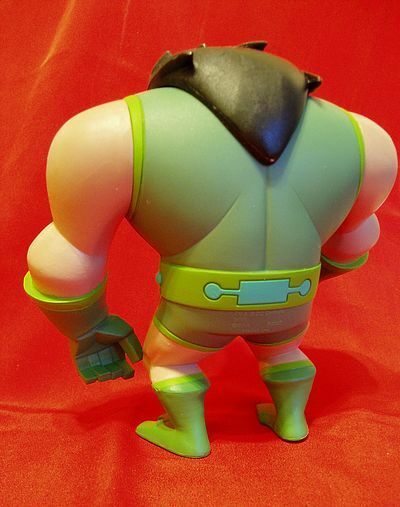 Unlike his papa Darkseid, who was first made by Kenner and then remade by Mattel, this bruiser makes his first Bruce Timm-styled appearance ever in this 2 pack. I’m happy to report that he’s a sturdy lug. No bendy extremities here, folks. You can pick this guy up by his toes or his fingers, and they won’t bend. Mattel definitely used a different plastic on him than on the demons, which is good…but annoys me a little because I recently participated in a Mattel Q&A, where I asked what it would take for them to use stronger plastics across the board. Their answer: “PVC 95 is the ‘hardest’ PVC we can use for JLU figures.” The disparity between Kalibak and the parademons proves otherwise, in my book. He’s also a rarity in the JLU line for having details sculpted onto his body. Those dots are actually elevated and the Kirby design work on his chest is also similarly raised. This figure is almost like a small sculpture in that respect (much like Lobo). Fans who have been waiting for this character since the days of S:TAS will not be disappointed by the quality of this sculpt. The only drawback is that it’s nearly impossible to see his eyes until you tilt the character backwards. Given that he’s not quite as tall as Darkseid – who he looks up to – it might have been better for them to position his head a little further back on her torso, or change the shape of his brow a little. Also, his arms really don’t allow for him to appear as though he’s fighting. Since that’s essentially all he ever does (like the demons), I feel this holds the sculpt back. 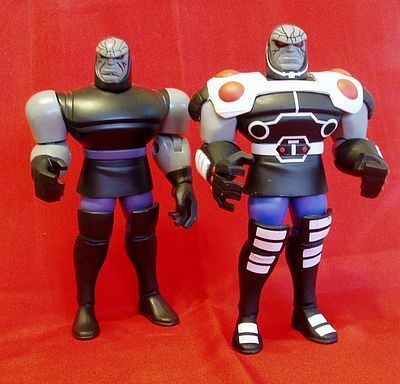 Darkseid was one of the few figures to get 10 points of articulation (neck, shoulders, waist, elbows, legs and knees) back when Mattel briefly considered going that route with all their JL figures. The others in that wave didn’t turn out so well because of loose joints, so unfortunately, the idea was abandoned. This Darksied, unlike the first edition, has loose joints in the crotch area. His legs wobble back and forth a bit…but I still feel the 10 POA make this figure a standout. Thanks to them, he can raise his hands in a threatening manner during speeches, just like he would on the show, or twist to glance over his shoulder. Heck, he can even break-dance if you want him to! The shoulder piece and skirt do limit his pose-ability a bit, but it’s a minor issue. You can do a lot with this action figure, as it should be. The parademons get the more standard 5 POA. Their heads spin around, which makes for some fun Poltergeist-style poses, but should you attempt to lift their arms, you run the risk of throwing off their center of gravity. So, essentially, you can’t really do much with these guys at all. 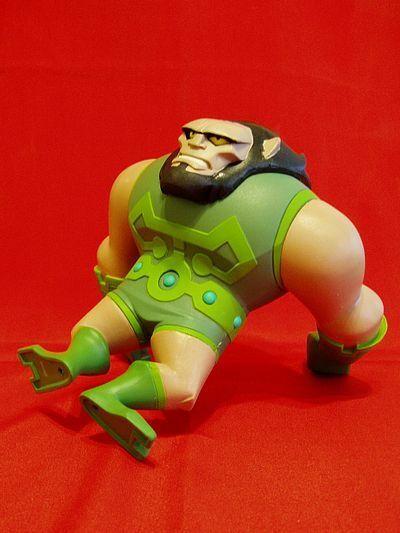 Kalibak’s arms can be placed in various positions because he’s overall much more sturdy, but like the demons, rotating his legs serves no real purpose. Unless you want it to look like Superman broke them, of course. Kalibak’s massive head is also stuck firmly in place, so he’s limited to 4 POA, two of which are essentially useless. It’s a shame his arms weren’t sculpted more like his father’s, with a joint at the elbow and one hand in a fist, at least. The parademons on S:TAS often flew around with simple blade-on-a-stick-like weapons. Would it have been so hard for Mattel to sculpt one and include it in the pack for the demons to fight over? 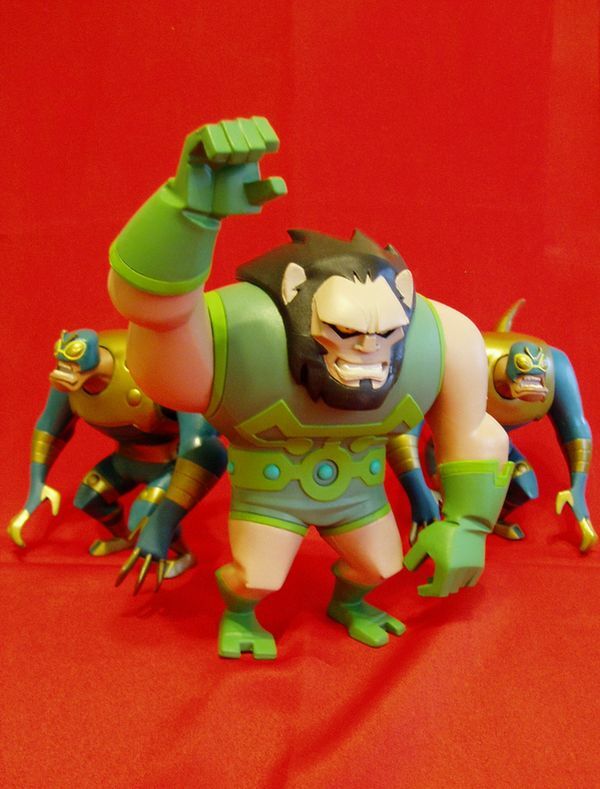 More upsetting is the absence of Kalibak’s Beta club, his trademark weapon in both the shows and comics. First Mattel skimps out on including Lobo’s chain…now this. No wonder Kalibak looks so mad! Here’s where things get nutty. Plain old nutty. 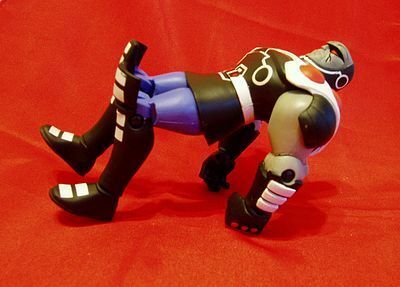 Apparently, Mattel was going to release a six-pack featuring Darkseid, Kalibak, the two demons and Superman and a repainted Orion to Target stores. Then, it was decided to cease production on six-packs, and the exclusive figures were redistributed to fans via the horrible shopping experience known as Mattycollector.com. Previous six-packs, from what I’ve heard, ran somewhere in the 15-20 dollar range at Target stores. These two parademons, however, cost a stunning 25 dollars, plus shipping and taxes. Told you it got nutty. 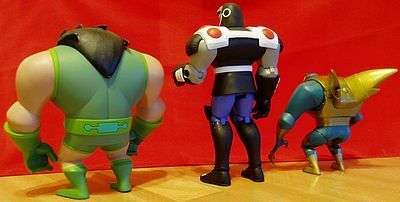 Fans have been clamoring for “army builder” type figures in the JLU line, and these were ideal candidates…but pricing two at 25+ bucks when a recent Target three-pack has Green Lantern and two brand-new-sculpt Manhunters for 15 bucks just leaves a bad taste in one’s mouth. Those hoping to ease their credit card debt by taking advantage of Matty’s Cyber Monday sale – which offered a discount of 10% for purchases over a hundred dollars – were further infuriated when Matty pulled these parademons from their site just days before the sale. Now, they’ve done it again with Darkseid/Kalibak. Mattel has responded to fan’s complaints with their own – they’d expected both releases to sell out as quickly as Lobo, and never had any intention of including them in an online sale. Perhaps the two-packs would have sold better if they’d been priced in the 15-20 dollar range? Or included a third parademon? Or a Desaad? No matter which way you cut it, 25 bucks is steep. If things had gone as planned, you would have been able to scoop all these figures up, plus two more, for 15-20 dollars at Target instead of 50 plus shipping. We all applaud Mattel for making them and getting them out to the customers, but the way they’ve done it has left everyone dissatisfied. 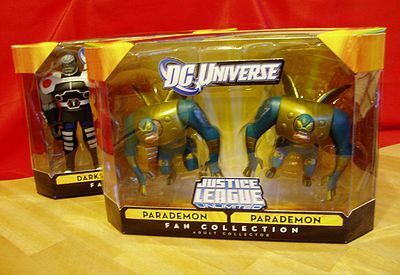 In a final painful twist, just this week at Toy Fair 2011, Mattel’s “Toy Guru” announced that the JLU line is coming to and end in the next twelve months, largely because the parademons didn’t sell out. According to him, Mattel had hoped JLU would be as successful online as their Masters of the Universe Classics brand, which is an absurd expectation given how huge He-Man was in the 80s and how JLU has been, by and large, a retail brand. So, there you have the whole depressing story. Still glad we got the parademons? You’ll notice I scored the three figures separately even though they came in two packages, so tallying up the points here is a bit tricky. 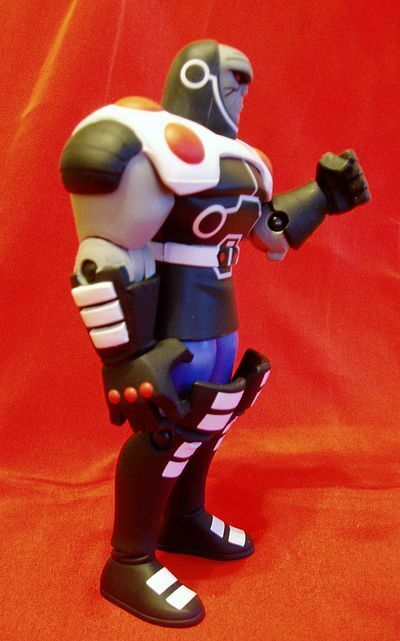 At the end of the day, I think the Darkseid/Kalibak pack is a better value, because Kalibak looks so darn great and Mattel really put some effort into making this new Darkseid worth picking up. The demons are nice, but just not as well-made and decidedly too pricey (and possibly cursed). These were all originally sold through Mattcollector.com. Now you’ll have to browse eBay or try to purchase them second-hand from collectors. Expect to pay a little bit more. This product was purchased for the review by the reviewer. Photos and text by Disneyboy.